Why is our presentation based on content slides, and not the master slides? 1. Content slides immediately display a slide filled with information and data. This is useful, since you can see in advance how the slide will look when filled. 3. While creating master slides we have very limited number of instruments so it is almost impossible to create a custom and original infographics that could be edited by user. For example, if some illustration or vector infographics is inserted directly into the master slide, to change its size or shape we have to go into master slide editing mode, to make changes and only then edit the information in the content slide mode. This is inconvenient and greatly complicates the work. How to work with content slides. 1. 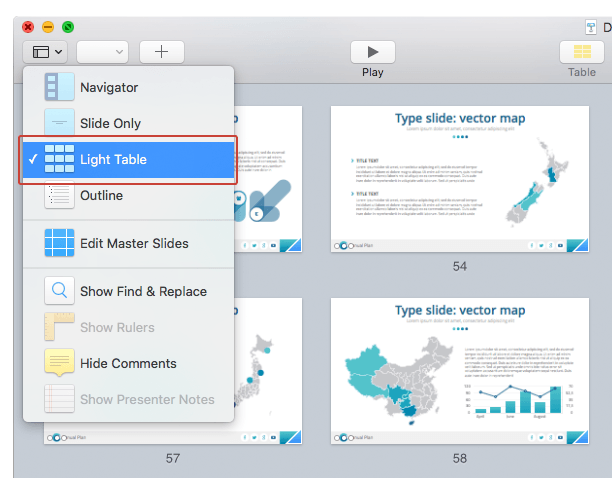 Using “Light Table” mode (top menu “View”> “Light Table”) you can view all the slides of your presentation. The scale of the slides can be regulated (slider at the bottom of the application window). One slide or group of slides can be moved using the mouse. You can also duplicate or delete the selected slides. To select a group of slides, use mouse + “Shift” or “Ctrl” keys. 2. Using “Navigator” mode (top menu “View”> “Navigator”) standardly you’ll see the working area and the sidebar with thumbnails of presentation slides. You can also copy/duplicate/delete slides directly from the sidebar with thumbnails. 3. Select the slides you need for creating a presentation. All fields are active. Click on the text box and the height of the change the demo-text to your own. At your discretion you can change the width and location of the field. 4. All graphic elements of the presentation are made in vector (except MockUP). Use PowerPoint standard tools to change their position, color or shape.